Based in Los Angeles, December Tea is a blog by Lauren Bailey. Her posts explore the world around her, through words, pictures, and constant cups of tea. The month of December teas continues as this second week of the calendar found most of the teas taken to go. It was a week of early meetings and calls at work, so often I would brew a pot, pack up my trusty keepcup and head out the door. By the time I get to work, I’d either finished my tea entirely or the remaining bit that was steadily growing colder would be paired with my desk breakfast. Working through the calendar, it became more apparent to me which teas were better suited for a commute and which were better for staying still. The more complex the tea, the more I enjoyed it when I could sit and enjoy it, whereas some of the more straight forward blends lended themselves to travel. They were familiar and reassuring moving in and out of traffic. Ideally, I would like to be able to sit and enjoy my morning cuppa before leaving for the office, but this rarely happens, except on weekends. I am either rushing to get out the door as getting up early seems harder in these winter months, even though most days do find the sun shining through the bedroom window and the weather is nothing to complain about; or I brew a cup to enjoy while I’m getting ready and have to leave right as it reaches the perfect temperature. It is my opinion that a tea should be able to be just as good on the road as it is when you have moments to spare but in practice, I have been discovering that that is not always the case. This selection of teas also saw a few varieties repeated. It made me wonder how the order of the advent calendar is selected. Are the teas placed at random or is there someone who thinks through the placement of each teabag? If the latter is the case, then what was the selection process for picking these teas? I am also curious if the teas change year to year or if there are favorites that always make an appearance. As I ponder the ways in which each brew is presented, let’s get to this week’s selections. Sunday, 9 December - Royal Blend. A black tea. Amber in color. To me, it tasted similar to Earl Grey without being too heavy on the bergamot / florals. Doesn’t need accompaniment but would probably go well with milk. This was a Sunday morning tea. I drank it in the morning as I prepared for my book club meeting where we discussed Everything Under by Daisy Johnson. It was a cup before heading out that was enjoyed while I got ready with the heater on. Monday, 10 December - Chai. When drunk on its own, I found that there wasn’t much spice on first tasting. Mr H doctored it up with cardamon, cinnamon, clove, black pepper, a splash of cold Royal Blend and simmered it all together in milk. I was expecting it to be spicier. I’m not sure this is a chai I would have again though my like for it could be increased were it to be brewed longer. Mr H thought it was a good chai and made for a good starting place to put your own stuff in. They left room for experimentation though it’s not quite a blank slate. The chai was drunk in the evening after a dinner of eggplant parm with pasta, and an appetizer of fried green tomatoes. It was a nice way to end a meal as it’s sweet on the tongue. Tuesday, 11 December - Camomile and Bee Pollen Infusion. The bee pollen gives it some body. Nice smell. The camomile is light and doesn’t taste overly herbal, which I sometimes find can be the way with camomile. Golden in color. Smooth. Can really taste the bee pollen, which I found added a honey flavor. This was drunk in the evening as a way to unwind from the day. It was more exciting than a standard camomile which is not an infusion I tend to enjoy. Wednesday, 12 December - Royal Blend. I was surprised to be reunited with the Royal Blend so soon. Fortnum’s says the tea’s “honey-like flavour makes it an ideal partner to a strong breakfast marmalade or lunchtime Rarebit.” I think both would’ve been delightful alongside it. Had there been toast on hand I would’ve eaten it with Fortnum’s Burlington Breakfast Marmalade. This was a tea we also taste tested out in New York and it proved to be a crowed pleaser like the Classic Earl Grey. 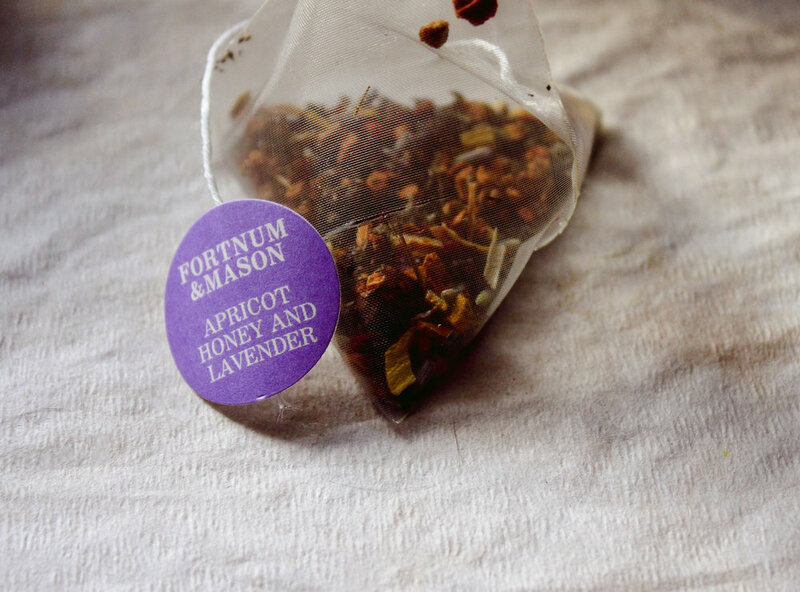 This tea is described as a strong blend which makes it ideal for any time of day. It was first created for King Edward VII in 1902. Thursday, 13 December - Rose Puchong. The Rose Puchong has been a favorite since it’s introduction to me. It doesn’t taste like rose perfume but proper garden roses, and can transport you to other locations with your first sip. I did find that it’s not as good when you’re rushing out the door because my focus is then pulled away from the tea. That might not be as the same for you and could be the tea you enjoy for your commute. Friday, 14 December - Apricot, Honey, Lavender Infusion. Mr H tasted something like licorice in this blend whereas I found it to be honey forward. That was the first thing I tasted. It reminded me of spring in a cup and a bit of Howard’s End. I didn’t get much of the lavender once brewed though I could identify it smell before brewing. It’s on the sweeter side of the infusions. Think it would go well after a meal as it has that little bit of sweetness that you sometimes want. Saturday, 15 December - Breakfast Blend. The breakfast blend is not going to be a builder’s tea. It is straight forward but fancier than an average cup of English breakfast. Amber in color. Doesn’t grow bitter when sitting in the pot. Doesn’t have that punch in the face quality to it, if that’s something you’re looking for. Paired well with my breakfast of eggs, heinz beans and cheese on toast. The beans were leftover from the jacket potato I made a couple days before - which was delicious - and I found the tea did a nice job of tying it all together. Sunday, 16 December - Moroccan Mint. This time around the Moroccan Mint was enjoyed in the evening. During our time in Vermont last winter, we picked up a Spearmint Tea that smells delicious and tastes even better, and is one that I often like to enjoy in the evening with a bath and a book. The Fortnum’s Moroccan Mint reminds me a lot of this spearmint tea and served a very similar role. It was light yet strong on the mint flavor. I would return to it in the future. Another green tea that I also like of Fortnum’s is their Green Tea with Elderflower. It is a slight departure from the mint though I think if you’re a fan of this one, you’d like the elderflower as well. 2016 © December Tea. Powered by Squarespace.